افندی زاده, شهریار, شاه نظری, مرتضی. (1385). بررسی و ارزیابی شرایط تعادلی عرضه و تقاضا برای حمل کالا از مبادی ورودی به مناطق مصرف. پژوهشنامه حمل و نقل, 3(2), -. 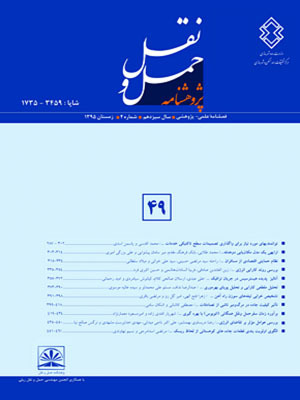 شهریار افندی زاده; مرتضی شاه نظری. "بررسی و ارزیابی شرایط تعادلی عرضه و تقاضا برای حمل کالا از مبادی ورودی به مناطق مصرف". پژوهشنامه حمل و نقل, 3, 2, 1385, -. افندی زاده, شهریار, شاه نظری, مرتضی. (1385). 'بررسی و ارزیابی شرایط تعادلی عرضه و تقاضا برای حمل کالا از مبادی ورودی به مناطق مصرف', پژوهشنامه حمل و نقل, 3(2), pp. -. افندی زاده, شهریار, شاه نظری, مرتضی. بررسی و ارزیابی شرایط تعادلی عرضه و تقاضا برای حمل کالا از مبادی ورودی به مناطق مصرف. پژوهشنامه حمل و نقل, 1385; 3(2): -. یکی از مباحث مهم بخش حمل و نقل، تعیین مقدار حمل بهینه کالاهای وارداتی از مبادی ورودی به مناطق مختلف مصرف است، در این تحقیق با شناخت عوامل تعیین کننده تقاضای جاده ای، اقدام به تدوین مدل برنامه ریزی خطی به منظور معرفی مقادیر بهینه حمل کالاهای وارداتی از مبادی ورودی به مراکز مصرف شده و هدف از آن کمینه کردن کل هزینه های حمل و نقل است.از آنجا که سهم واردات کالا از مرزهای آبی بیش از 94 درصد است، بنادر به عنوان مبادی ورودی کشور در نظر گرفته شده‌اند. سپس زمینه های نظری روش برنامه ریزی خطی (LP)، خصوصیات و فرضهای اساسی برنامه ریزی خطی، شیوة ساخت مدل و مدل عمومی ریاضی در برنامه ریزی خطی مشخص شده و روش ساخت مدل عرضه و تقاضا ارایه می شود. همچنین برای منطقه بندی انتخابی در این تحقیق با تو جه به عوامل مهم از قبیل جمعیت، شبکه توزیع، موقعیت جغرافیایی استانها، وضع موجود شبکه را ه های استانی و نرخ خدمات رسانی حمل ونقل، استانهای کشور به عنوان مراکز مصرف در نظر گرفته شده اند. ضرایب تابع هدف در مدل تقاضا ، کرایه حمل مبدأ - مقصد کالا هستند و در توابع قید نیز ظرفیت هریک از مبادی ورودی و نیاز هر استان از کل واردات کشور ضرایب توابع هستند. این ارقام براساس اطلاعات سازمان راهداری و حمل ونقل جاده ای و سازمان بنادر و کشتیرانی استخراج شده اند. نهایتاً به کمک روش برنامه ریزی خطی، مقادیر حمل بهینه کالاهای وارداتی از بنادر به مراکز استانها، مقدار استفاده از ظرفیت هر یک از مبادی، آنالیز حساسیت مربوط به مسئله و قیمت های سایه1 مربوط به محدودیت ها و هزینه های فرصت مشخص شده اند. 1Associate Professor, Department of Civil Engineering, Iran University of Science and Technology, Tehran, Iran. One of the main problems in transportation systems of various countries, specially in the recent years has been and will be the transport of imported goods from the entering origins towards the consumption areas. In this paper, by recognising the effective factors influencing the road transport demand in Iran, it has been tried to develop a linear programming model for calculation of the optimum values of transporting the imported goods from the origin points to the consumption centers. In fact, the problem is categorized as a problem of physical distribution of freights from several production sites to the consumption points. After solving this problem, a situation will be created by which the costs of distributing the imported goods is minimised.Regarding the high share of marine imports (94%) in the country, the southern and northern ports have been assumed as the entrance origins. Also due to the conditions of population, distribution network, geographical situation of the provinces, current provincial roads and the transportation service fares, the provincial capitals have been supposed as the destination or consumption centers. A background of the linear programming method, as well as its’ characteristics and assumptions and the method of a LP model construction will be explained and after that, the LP model will be applied to find the optimum values of transporting goods from origins toward destinations, and simultaneously to minimize the total costs of transport. The objective function coefficients for this LP model are the Origin-Destination fares of transportation. For the constraints of the LP model, capacities of the ports and also consumption values of the provinces have been supposed as the right hand sides. They have been extracted from the information provided by The Road Transportation and Terminals Organization, and The Ports and Shipping Organization, which both are governmental administrations working under the Iranian Ministry of Roads and Transportation. At last the problem is being solved and the best quantities of transport of goods between each O-D pair, as well as the amounts of capacity engagement in each origin port, sensitivity indices of the problem, and the shadow pieces for each constraint will be introduced.Results of this study show that the minimized total cost of this transportation system reaches to 3,156 billion Rials which has been obtained after 34 repeats of the Simplex method. Also it shows that the optimal pattern derives a situation in which not all the consumption centers should be assigned shares from all origins, but the current situation in the country is despite that; In fact, in the current situation, all the provinces are importing goods from all ports, and this is not optimal.